'Tis the season to make cookies! 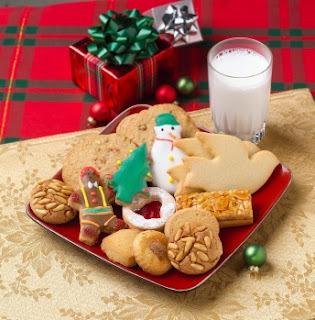 There are so many kinds of Christmas cookies to choose from-- chocolate chip, peanut butter, oatmeal, the list goes on and on. There are lots of egg substitutes that can be used in cookies. I have found that one of the best egg substitutes to use when making cookies is silken tofu. Yes, tofu. You may find this quite disgusting, but before you judge, try it and see for yourself! Silken tofu has no flavor when it is put in cookies, because the tofu will take on the flavor of the cookie. I would like to know what your favorite cookie is! Please vote on the poll that is located on the right side of the page. If your favorite cookie is not one of the delectable choices, then you can comment below and let me know what your favorite cookie is! In the coming weeks, I will be sharing some of my favorite eggless Christmas cookie recipes. Paul voted for the coconut macaroons. I vote for Chocolate Chip, Snickerdoodles, Oatmeal, Cream Cheese, and Sugar! It's too hard to just choose one! I had a friend who always made Snickerdoodles at Christmas. Melt-in-your-mouth good!